After hitting 100 followers I decided to celebrate with some giveaways!!! 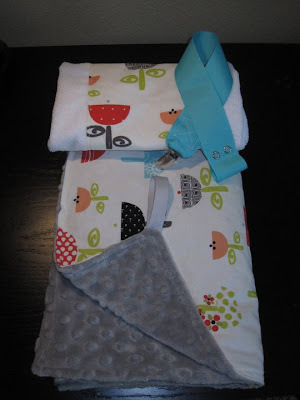 Blankey, Burpcloth and Binky set from Kali Vise Handmade!! I went to High School with Kali, and she just recently opened up her own Etsy shop! She makes the cutest things, hair clips and camera straps and all sorts of other things!! And it's all totally affordable! She's also expecting baby #1!!! The fabric will be gender neutral! Super soft minky blanket backed with an adorable print, with a matching burpcloth and binky clip!! If you don't have a little one, I'm sure you know of someone who does who would LOVE this! Mandatory Entry: Be a Google follower of this blog and leave a comment telling me you are! 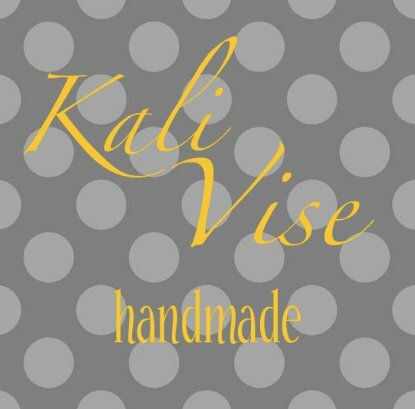 Visit Kali's Etsy shop and let me know what else you like! AND I am a fan of your facebook page! I visited Kalis etsy store and I love the camera strap becuase its the one she designed for me! Yay! I love it and use it always! I just liked Kali on facebook . . .
That baby blanket is so adorable! i follow you!!! i adore that fabric. what a talented gal. i just went to her etsy shop and oh my word, the 'mr man onesie' ... ! *adorable*!! i liked her facebook page! Ooo visited her Etsy and my goodness! I LOVE her binky clips for the girls and her headbands for me! Especially the double rose headband! I'm a follower of your blog (and fellow MoM of 15 month old fraternal boys)! I also visited Kali's etsy store - the twigs & berries pattern blanket is super cute! I am a Google follower of your blog (and fellow MoM of 15 month old fraternal boys)!